The last few days have been quite odd. We have had wild gusts of wind, some small spurts of rain and my computer decided that it did not like this energy, so it would not let me get onto the Internet. As a result, I am downloading several days of photos for you to look at. With more small to medium fires in the foothills, and temperatures in the 90's, the air is cloudy instead of clear. Hopefully, the fires will get under control and the temperatures will settle down (not likely until after this Fourth of July weekend), the cotton will stop flying off of our dear old Cottonwood tree and the garden will pop back to normal. Right now, it looks a bit worn out. 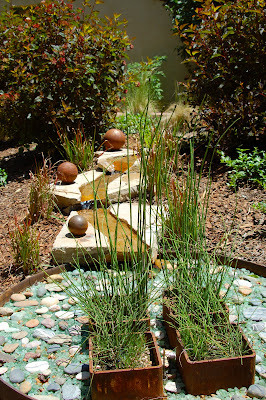 As we walked the neighborhood on last weekend's garden tour, we found some gardens that had not been chosen for the tour.... but were worthy of a peek. So, here are a few photos of some lovely spots along the way. We just felt that we could sit and enjoy for awhile....in these beautiful gardens. back yard and enjoy a quiet afternoon with a book. Isn't this a lovely entryway?? Good Monday Morning! There was a fire in the Boulder Foothills last night...... the constant fear of fire in the Summer is not to be underestimated. The GOOD news is that they were getting it contained quickly...making it a good morning, today. I hope this gives you the same feeling that I had. More photos all week long....and hopefully, so decent art work to share by the end of the week. I have no clue what this leaf (or tree) is...... Do YOU??? which welcomed you to the back yard. This was our last garden tour of the summer. It was in Sweet Hubby's old stomping ground, and we just couldn't resist. When my husband was starting school, this was his neighborhood. As we parked our car to get the tickets at Montview Presbyterian Church..... we noticed that right across the street was the Montview Public Library.....where Sweet hubby checked out his first library book. 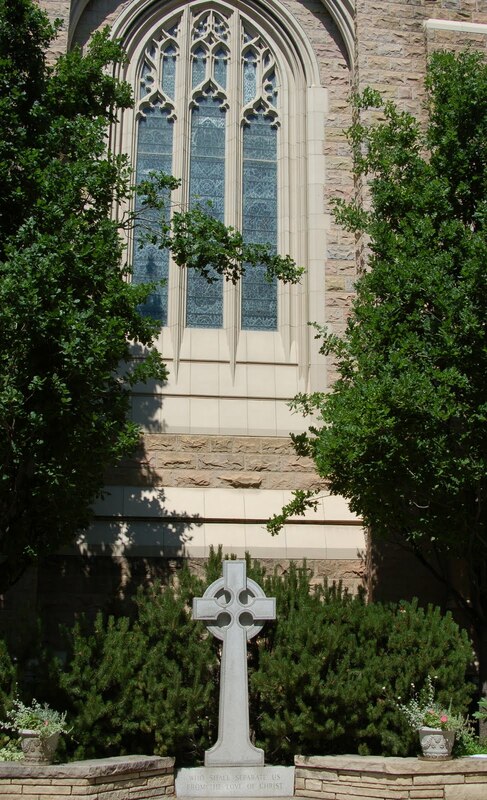 The whole day was filled with a bit of nostalgia, but also a sweet thrill, because this old stomping ground of great diversity, in Denver, has grown into a beautiful, proud, cohesive collection of people, homes and gardens. It was a day of delight. The special treat was that each garden was hosted by the owner, who's pride in their garden (not to mention the first hand knowledge of design and plantings....and work involved) was a treat. All in all, despite a very warm day, it was a perfect way to spend.... in other people's gardens. will draw garden lovers, for years to come. their newly planted "Contemplative Garden"
Many of these are getting to a place of glory. I will be sharing photos all week. Hopefully, by the end of the week, I will also have some work to share with you. I am in the Pink, with the blooms on our Peony. It's been three or four years since we have planted it, and the blooms are really starting to come. I think that they have doubled each year, so this year we are really getting a 'show'. Of course, the long and cool May weather didn't hurt. 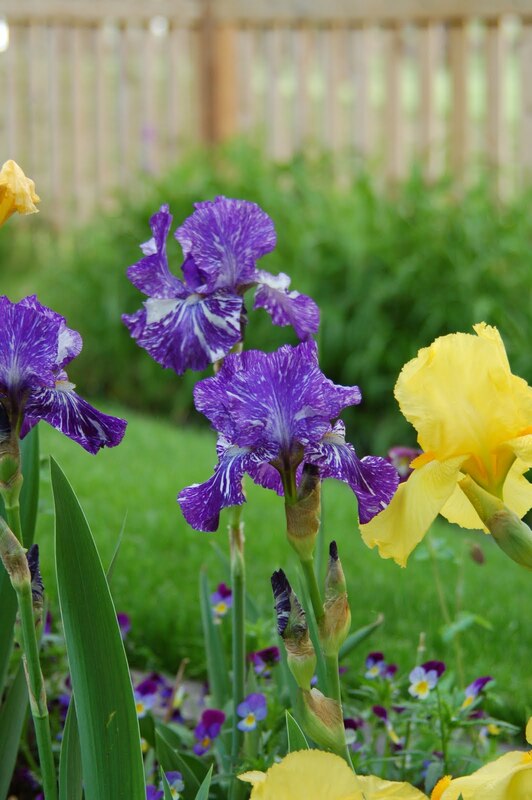 It gave the blooms everything they needed to burst forth, when the Sun finally came out. Again, a metaphor for life. Sometimes it takes a lot of cold, hard rain in our lives, to wake us up to the possibilities when the sun does come out. The sun always comes out at some point..... just as we can expect the rains and hard weather. It's the holding on.....working hard.... and preparation that allow us to weather the tough times and get through to the sun. I guess, I am grateful for our beautiful weather this month. I am praying for all of the people in Minot, who, despite preparation, working hard and sunshine, are going to lose their homes to flooding. I know that eventually (just like, so many other areas this Spring & Summer) things will get better. Eventually, all will be "in the Pink". But for now, there are going to be some really tough times. I just wanted to let you see what I have been working on. I hope to place a graphite leaf among the pods and dry leaves, which are suppose to be falling from the tree. 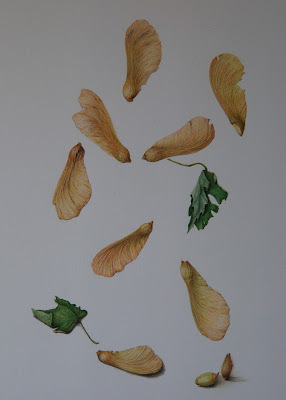 I thought that I would try something else for a change, as I have wanted to capture the seed pods for quite some time. Tomorrow..... I will show you what I am working on right now. I continue to work in colored pencil. Snow, Rain, Wind, Sun... it is Summer, isn't it?? The weekend was beautiful....if a bit windy....but extreme weather has popped up over our state today. My friend, who is in the mountains, woke to SNOW! We woke to rain and wind and what Winnie the Pooh would call, "a blustery day". So far, this summer, I have not gotten into the rhythm of the weather. This weekend was filled with gardens and more gardens. What fun. I can't say that these gardens were so fabulous, as to" blow me out of the water", like last weekend's garden tour, but they were pretty and maximized their use of space. I only took a very few photos, and the following were the creme de la creme of the tours. I have finished my piece of art in the studio..... However, I am waiting for one more piece for this puzzle and it is at a friend's home, that I will visit mid-week. I would like to put a leaf in the background, in graphite. So, I may take a photo for you .....but know that it is not finished....yet. Okay, make the best of today as it's the only one we have and when it's gone....it's gone. Clematis, growing along the fence. Roses always make me smile. 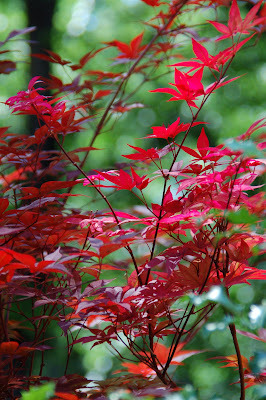 the Japanese Maple just popped up to greet us. I just arrived home from another local Garden Tour. I must say, that this time of year, I am a garden tour junkie.... no getting around it..... I just love to see the endless ideas that are created from this earth. Today, was a local delight. Another Artist's abode and a garden of magical surprises that accompanied it. 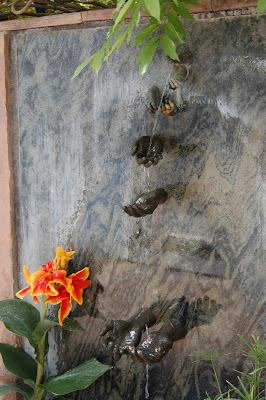 Several gardens were simple, yet filled with fun.....and last of all....a garden of love, in memory of this love. It was as perfect as it could be. Sharing it, was a gift to the rest of us. I did not bring my camera today. I just enjoyed the gardens (so you may be thankful that I have no more photos to share). However, tomorrow.....I am taking the camera, so we shall see what delights I can come up with for next week. Here are the last of the garden photos from this past weekend. Just enjoy! Have a fun weekend. and hike to the top of the hill. Each egg was approximately a foot long. The nest was a large bundle of twigs. 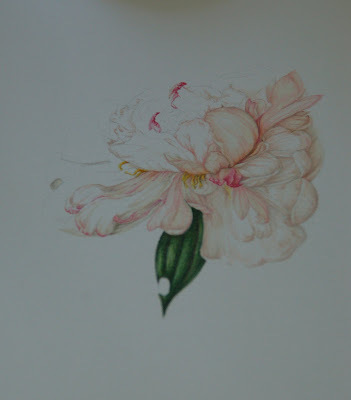 Just a quick peek at the colored pencil that I am working on. 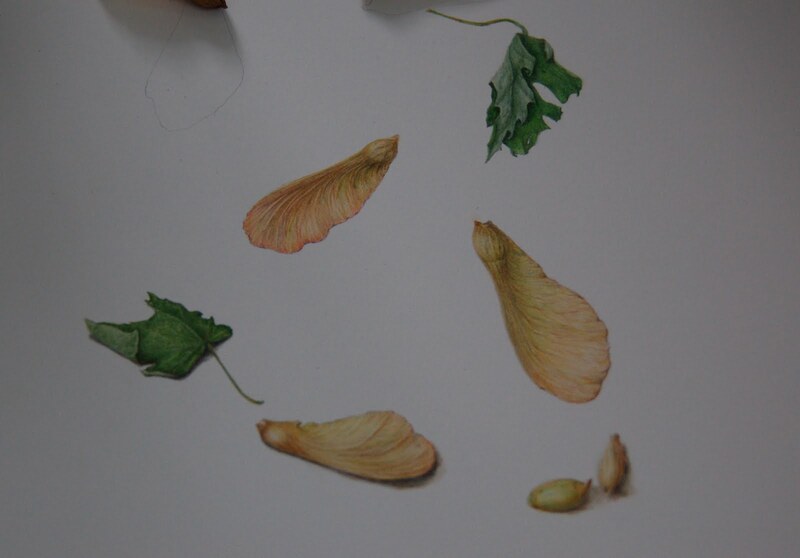 I hope that you can pick out the seed pods that are real and the one's that I have drawn. I hope to finish it tomorrow afternoon. I am painting... unfortunately, it's an Adirondack chair and stool....so work in the house is taking time from work in the studio. Patience (just a reminder to myself...). Rebecca Didomenico and her garden will be honored today. 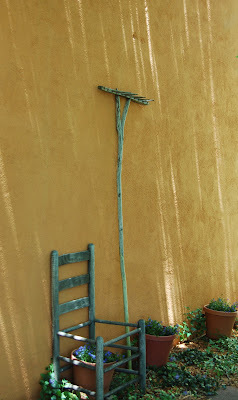 Not only did I love her artwork, but her studio, home and gardens were a completely unexpected "Wonder". As I was entering her home (my mouth gaping wide open).....I looked across the room to another soul whose mouth was in the same position. It was just hard to comprehend the beauty and creativity that sparkled in every square inch of this space. Here are some of my favorite photos.....with a few more tomorrow. 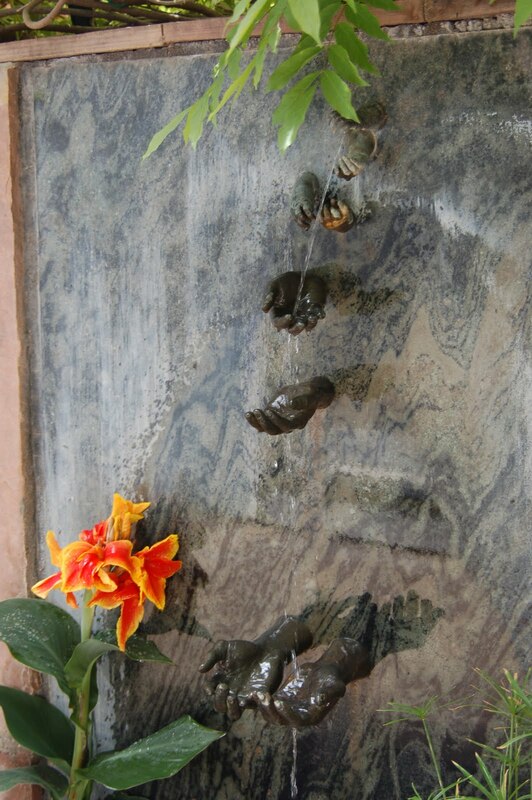 This fountain touched my heart. over them is just remarkable. Oh, to have a lap pool right outside your living room. I have only seen this in magazines..... but the reality is so much better. Hey, the Aspen Grove is pretty cool too! You had to keep your eyes open for so many little garden details. Clematis were placed throughout the garden....along the fence line. All of them were delighted with the space provided them. It knocked my socks off to see a Magnolia tree in the garden. can create a work of art! Susan Albers yard was amazing. behind their house, ended up as a unique art installation. Rebecca Didomenico created a "garden made up of small rooms"
This Fairy garden is a tiny delight. Wouldn't it be fun to create this with your kids or grand kids? A serene space in Rebecca DiDomenico's yard. created a perfect place to tuck yourself away for a quiet moment. 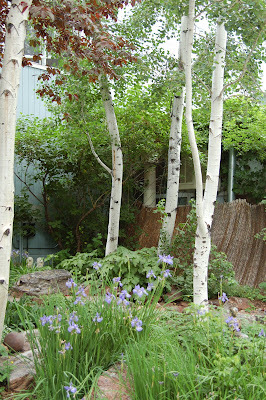 Sunday was a perfect day for a Garden Tour, so off we went again to Boulder, Colorado....... to the Eccentric Artists Garden Tour! WONDERFUL! FUN! INTERESTING! AMAZING! All these adjectives described the wonder of each of these gardens. Some gardens were tiny treasures, others just 'blew you out of the water' with their beauty and art. Over the next few days, I will try to share the fun of each of these gardens. 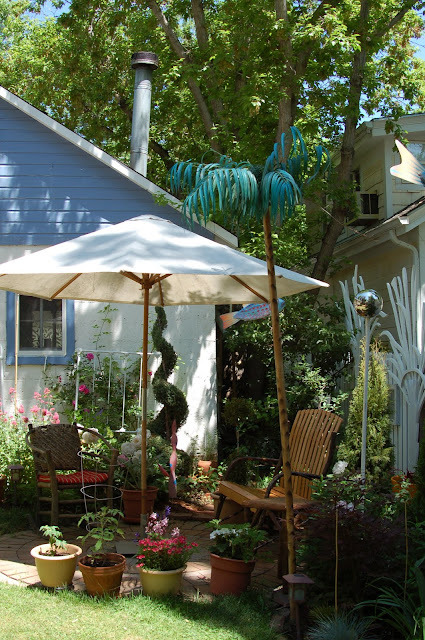 Not only were we excited about the garden style, but the Artists that live and work in their studios right on the premises. I probably would not get much work done, if I had some of these spaces to call home. The creativity of each space just blew me away. Wouldn't it be fun to have tons of "disposable income"? There was so much art that I would have bought and brought home. To be honest, most of these artists were very creative about using just what they had to it's maximum. Also, there was an incredible amount of recycling nature and man made materials to create both exterior and interior spaces, as well as sculptural effects in the gardens. I am rethinking my back yard!! Okay....enough chatter..... just enjoy the photos..... which I will be bringing to you daily, until I am done (and I have a bunch of fun photos.....so hopefully, I will get some work done to show you by the time you complete this garden tour). What a creative way to make a fence! You knew that I would have to add another Poppy! I just needed a change, so I checked out the choices on "Blogger" and picked this pink number for the blog. I liked the 'old' look, but honestly, the mustard was wearing on me....and amazingly, the salmon pink of the background and the turquoise headings seem to best reflect the flowers and paintings and my 'mood at the moment'. If you hate it..... let me know...... I will continue to play, until I get something that we all can live with. Until then...... it's going to be a pink kind of blog. Here is what I have been doing. I am nutty about these pods from a maple tree I found on my journey through life. I scooped up a whole baggie full of these and brought them home.....along with several leaves that had fallen from the tree. I may go back and get some more leaves to add in graphite, as a background. This is the first piece that I have really worked on in a very long time, so I am just going to let my heart rule my head and see what happens. As you can see, the photos are very dark...... due to these late afternoon clouds that roll in. By the time I get to taking photos of my work, it seems that the clouds cover the sky. I do believe that "La Nina" has changed the weather pattern in our area for the near future.....so until the sun decides to shine all day.....my photos will be very dark! 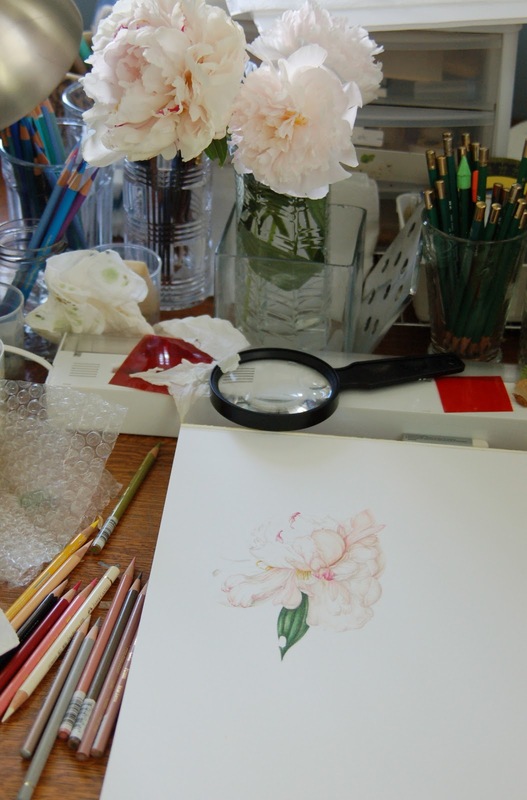 Well, it's Friday..... and I have some time for working in the studio, so off I go. 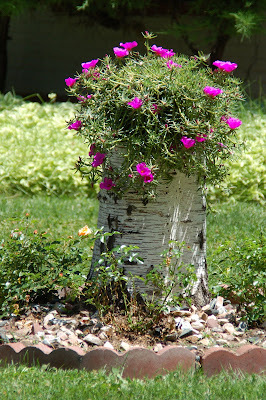 We will be going to a most unusual garden show this weekend..... hope to have some fun pic's on Monday. Enjoy some lazy time...... some reading time....... some fun time with friends...... and some laughter this weekend. We plan to do just that. I started this out as a watercolor and finished it up with colored pencil....so I guess it is a mixed media piece. These Columbine are a new hybrid, I think and are really fun to look at in the gardens. This one was done from a photo I took on a garden tour, last year. I don't often work directly from a photo, but this time I did, and I think it shows. It's a small piece...and it was the first piece that I have worked on in a long time...so a bit rough around the edges. I will share more of my work tomorrow. 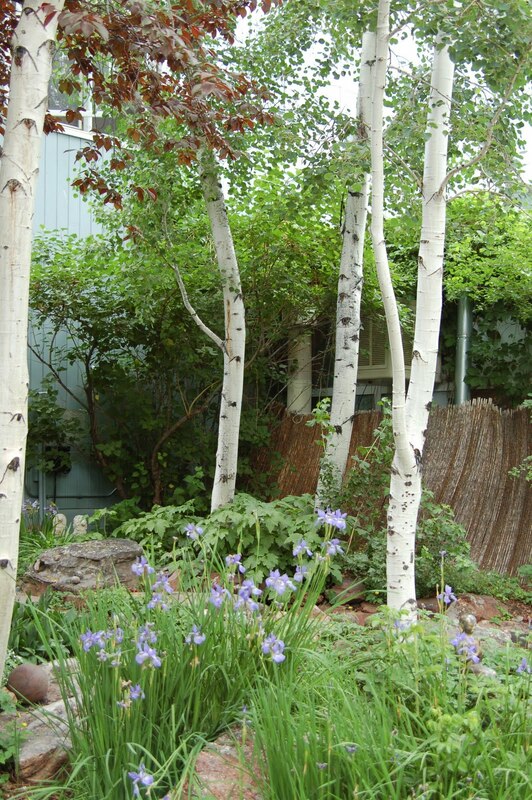 I love the Garden Tour Season, in Colorado. We are hooked on these tours and manage to schedule our lives around them each and every year. This year, I am even choosing a garden tour over a hike, for my birthday. 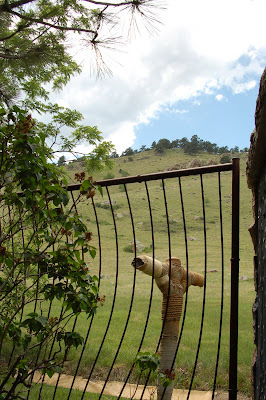 Usually, I love to take a hike, but with lots more snow melting this year, it may not be a possibility.....so I may find an interesting garden, instead. This weekend, we went to Boulder, Colorado and enjoyed some beautiful spaces. One, especially, managed to grow many plants that normally, do not thrive here. They had a Magnolia tree that simply took my breath away. It's always a delight to see things growing that aren't normally present here. Also, I manage to get so many wonderful ideas for our own garden spaces. We just had to go looking for a 'Smoke bush" tree (shrub?) after this outing. It's one that I have loved for a long time, but we haven't had the space. We had several trees die this past winter, so we have planted a "Forsythia" and a Smoke bush in those spaces. I do worry about the light and the moisture...but we will take a chance and see what happens. Tomorrow..... a small columbine, completed in watercolor and colored pencil. 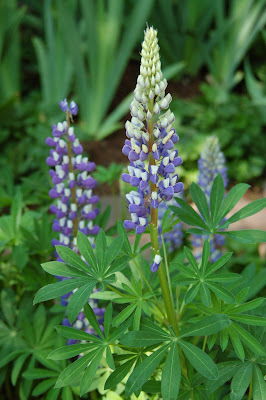 If you are a Denver Botanic Garden Illustrator..... today is the day to sign up for Summer/Fall classes. They are already filling up!! I am going to take one on painting bird's nests! 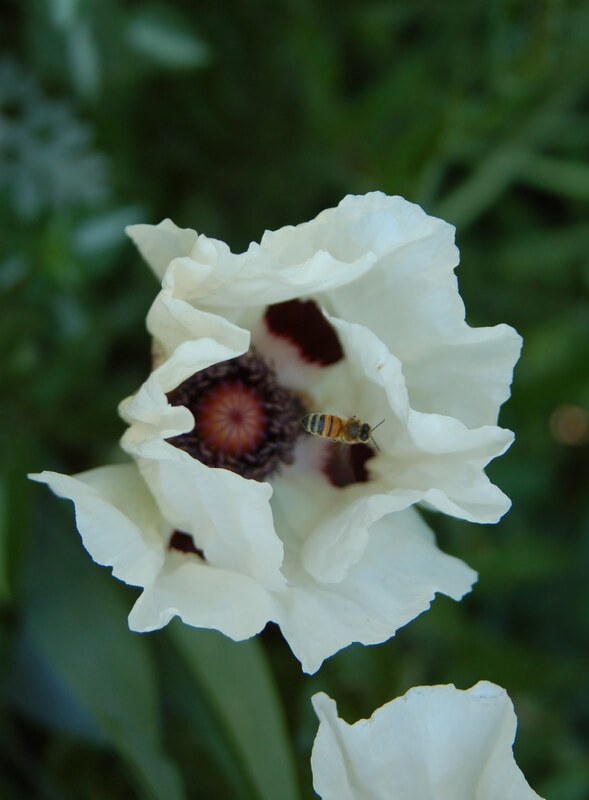 Is that why they are called "Poppies"? I never thought I would be so happy to see the sun....and of course, the heat is coming along with it. Bring it on, I say!! I am so ready for Summer to begin. I spent the entire day painting....but not in the studio. I went out on our patio and painted furniture. Our bench and Potting table (which I use for entertaining) were looking a lot worse for wear.... so a little green paint did wonders. Tomorrow.... (as I did yesterday....), I will work in the studio. I have three things going on right now. The first is a small Columbine painting in watercolor. It is resting....waiting for those finishing details. Secondly, I am working on a bowl of cherries....in colored pencil. 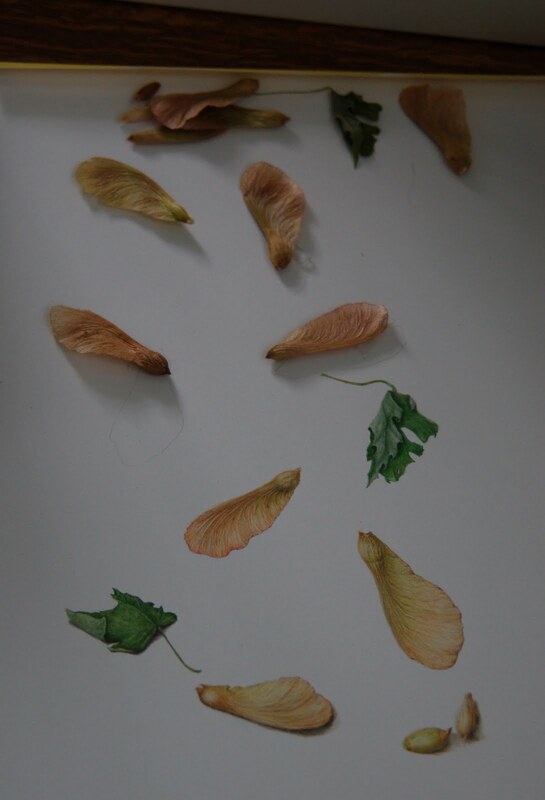 And lastly, I picked up a bunch of seed pods from under a maple tree and I am creating a colored pencil drawing from all of the seed pods. I will share photos next week, as I complete these projects. I don't feel like rushing to take photos because I would rather have it look like something worth showing than just throw it out there for you. Here are some more photos from the garden....the heat will probably just cause these flowers to wilt, but it's been very nice to have them for so long this Spring. tucked into a bush on our Memorial Day walk. They just keep coming back with great glory each year. from a spot where they refused to bloom. I think they are very happy in their new spot, don't you? ?